The apple leaf hopper (or canary fly in Tasmania) is increasingly becoming an issue in IPM orchards. These sap feeding insects are 3-4 mm long and yellow in colour. They can quickly build up to plague levels particularly in dry years as has been seen in throughout Australia this season. 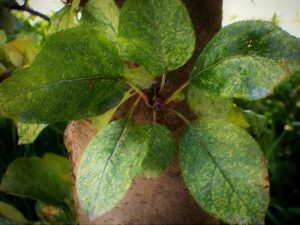 Their feeding mottles the leaves reducing the trees photosynthetic capacity and causing irritation to pickers when inhaled or when they fly into workers eyes. Apple leafhopper have 1 or 2 generations per year depending on the region and the climate. The first generation normally occurs in early December and the second emergence occurring in March, during the harvest. During the production season, leafhoppers lay their eggs within the midrib and veins of the leaves. In late autumn, the second generation lay their eggs within the fleshy wood of the new season’s twigs where they subsequently overwinter. Their resurgence has been linked to reductions in broad spectrum insecticide use. Maldison (Malathion) is the only registered chemical control in Australia, however, it is known to have numerous off-target effects on both pollinators and natural enemies and therefore should be used with caution. 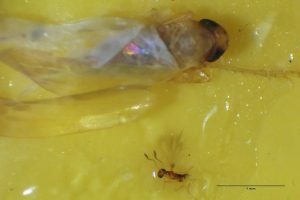 There is one known natural enemy for apple leafhopper in Australia, a tiny parasitic wasp, Anagrus armatus. This tiny wasp lays its eggs inside leafhopper eggs. Unfortunately, these wasps are currently only found in low numbers even when leafhopper numbers are at extreme levels. It is unclear why this wasp is not controlling this pest to the same levels as it did when first released in Tasmania in 1935 when up to 90% parasitism was the norm.